Overview: geno2pheno[coreceptor] - a tool for predicting HIV-1 coreceptor usage from the viral sequence information. What do the significance levels mean? For questions, remarks, or suggestions please contact coreceptor@mpi-inf.mpg.de. Several members of a new class of anti-HIV-1 drugs, trying to prevent the viral entry into the cell, have arrived at the final stage of the drug development pipeline. An important subclass of these entry inhibitors are drugs that target one of the receptors that can be used, in addition to the main receptor CD4, by HIV-1, as a coreceptor to enter the cell. The most important HIV coreceptors are the chemokine receptors CCR5 and CXCR4. HIV-1 particles fall into three classes according to which of them they can use to enter a cell: some can only use CCR5, others can only use CXCR4, and some can use either of them. Before and during drug treatment with a coreceptor antagonist it is important to find out about the coreceptor usage of the virus population in the patient. Currently, expensive and time-consuming experimental assays are used for this task. In contrast, bioinformatics methods for predicting coreceptor usage directly from the sequence are cheap and fast, because sequencing has become a routine task in biotechnology. geno2pheno[coreceptor] is such a bioinformatics tool, currently based on support vector machines: it predicts HIV-1 coreceptor usage from the V3 region of the HIV envelope protein gp120. It is very easy to use: you do not have to cut the V3 loop out of your sequences and you also don't have to align your sequence manually - geno2pheno[coreceptor] does all this automatically. The tool consists of two screens: when visiting the geno2pheno[coreceptor] web site, the input page is shown. Here you can paste in or upload your sequence, and adjust some options. On clicking the "align & predict" button, the output page will be displayed. This may take some seconds due to the computations that have to be performed. A field labeled "Identifier". Here you can type in supplementary information about the sequence. This is not obligatory, just an option that helps you not to confuse the printouts of the predictions: The identifier will be shown, along with other data, such as the FASTA header of the sequence (if available) and the date when the prediction has been made, as the first part of the output page. A box where you can select how conservative the predictions of CXCR4 usage will be. For example, if you adjust the CXCR4 classifier to be very conservative, only few sequences of viruses that cannot use CXCR4 will be predicted to be CXCR4-using. However, the drawback of a very conservative classifier is that there will be more CXCR4-using sequences which will remain undetected. This is the fundamental trade-off in classification. If, on the other hand, the classifier is adjusted not to be conservative, most sequences that can use CXCR4 will be detected, at the cost of a higher number of "false alarms, i.e. sequences for which CXCR4 usage is predicted by mistake. The technical details of how to adjust the degree of conservativeness will be explained below. Two fields where you can input the sequence data. This can be done in two ways: The first way is to specify the name of a file to be uploaded. This can be done either by typing the file name directly into the upper of the two fields or by browsing for the file. The second way is to use the copy/paste mechanism of your web browser to paste the sequence data into the lower of the two fields. Whichever of the two ways you choose, your sequence data may either be in plain text or in FASTA-format. In case you want to have a batch run you save your sequences in a FASTA file and submit it to the webserver. The system will generate a prediction for each of these sequences and report them in a table that can be downloaded in csv-format (which can be opened with Excel, for instance). In this case you have to have to define the FPR cutoff by yourself. E.g. if you choose the standard cutoff of 10% then a value below 10% is predictive for an X4 virus whereas a value above 10% reflects an R5 virus. Further, it is no problem if, as a result of population sequencing, your sequence contains mixtures (non-unique nucleotides): our method can deal with them. Additional clinical parameters. The viral population in vivo is usually a mixture of heterogenous variants, often termed as the quasispecies. To obtain a representative sample of this quasispecies, a substantial number of clones would have to be picked. However, in routine clinical practice, this is not feasible. Instead, clinically derived samples are usually sequenced with population- based or bulk approaches. In general, these techniques are unable to reliable detect minority species covering less than approximately 20% of the viral population. Furthermore, these sequences often contain mixtures of co-existing viruses which leads to a substantial decrease in predictive performance in comparison to clonal data. In a study on antiretroviral-naïve samples (Sing et al., 2007), it could be shown that additional clinical data like CD4-cell counts can act as surrogate markers and improve predictive performance. The data in this study has been used to train additional prediction models. By setting different clinical parameters, a second prediction based on this additional information is displayed. However, it has to be emphasized that these models are generated from antiretroviral-naïve samples. The action box determining what is to be done. The most important option is labelled "align & predict". Upon selection this option, the V3 region will be extracted out of your sequence, an alignment will be computed, and a prediction will be made. The results will be shown on the output page, which is displayed when the computations are done. The "Reset form" option can be used to clear the form and to set the significance levels back to the default values. "Load a sample sequence" can be used to get to know the program without the need to supply a sequence. Finally, the "Switch to vertical layout" selection allows users with small displays to see the page properly. 3. What do the significance levels mean? As mentioned above, the significance levels let you adjust how conservative the prediction of CXCR4 usage will be. How to interpret it exactly is not difficult to understand and will be explained in this section. Consider the picture above. Here, we have plotted a histogram of the scores for the tendency of the virus to be X4-capable (can use CXCR4) that were predicted by our (old) method for sequences with known coreceptor usage. The plot was computed for the task of detecting whether a virus is X4-capable. Thus the intention is that high scores indicate a high tendency of the virus to be X4-capable and low scores indicate a tendency of the virus not to be X4-capable. In the plot, the x axis represents the predicted scores, and the y axis shows the number of samples which were assigned a particular score by the method. The blue bars represent the histogram of predicted values for the sequences that are not X4-capable, and the red bars show the histogram of predicted values for those sequences that are X4-capable. Since the situation which is shown here is about detecting X4-capability, those sequences that areX4-capable (shown in red) are called "positive" samples and those that are not are called "negative" samples. The tendency that the positive samples attain a higher score than the negative samples is clearly visible from the plot above. However, you can also see that there is significant overlap between the two distributions for the positive and negative samples, pespectively, so perfect classification is not possible. This leaves us with the problem of how to choose an appropriate cutoff for prediction, such that all samples that are assigned a score greater than the cutoff will be predicted as X4-capable and for all samples that are scored below the cutoff, the prediction will be that the virus is not X4-capable. To understand the trade-off that arises, have a look at the following picture, which is the same as above, but with three different possible cutoffs shown. As a start, imagine that you select the leftmost of the three cutoffs that are shown, at the value -1.5. This means that if a sample is scored below -1.5, the virus is predicted as not X4-capable, and if it is scored above -1.5, the prediction is that the virus is X4-capable. As you can see from the picture, with this choice of cutoff, you will detect virtually all X4-capable samples (in red), but you will also get many "false alarms", since most of the X4-incapable samples score above this cutoff as well. In contrast, if you now assume that you have chosen the rightmost of the three cutoffs (at 1.1), you will almost never predict by mistake that a sample is X4-capable, if in fact it is X4-incapable, because almost all X4-incapable samples are scored below 1.1. However, the drawback of this cutoff is that a lot of X4-capable sequences will remain undetected, because they are scored below 1.1 as well. A suitable choice of cutoff will likely be somewhere in between these two extremes, for example such as the cutoff shown in the middle in the picture (at -0.5). Still, it is important to realize that there is no "best" cutoff, since its choice depends on your particular interest. If you want to get very few false alarms and you can accept to miss some X4-capable sequences instead, you might want to choose a cutoff that is higher than if your interest is more to detect as many X4-capable sequences as reasonably possible. The true positive rate (also called sensitivity) is the probability that, if we show a positive sample to the classifier, how likely it will be that it will predict the sample as positive. Formally, if we denote by YP the predicted class and by Y the true class, the true positive rate is P( YP = 1 | Y = 1). Likewise, the false positive rate is the probability that, if the classifier is shown a negative sample, it will predict it as positive. Formally, the false positive rate is P( YP = 1 | Y = -1). The true negative rate (also called specificity) is the probability that if the classifier is presented a negative sample, it will predict it as negative. Formally, the specificity is P( YP = -1 | Y = -1). We now also see why the false positive rate equals (1 - specificity), since P( YP = 1 | Y = -1 ) = 1 - P( YP = -1 | Y = -1 ). 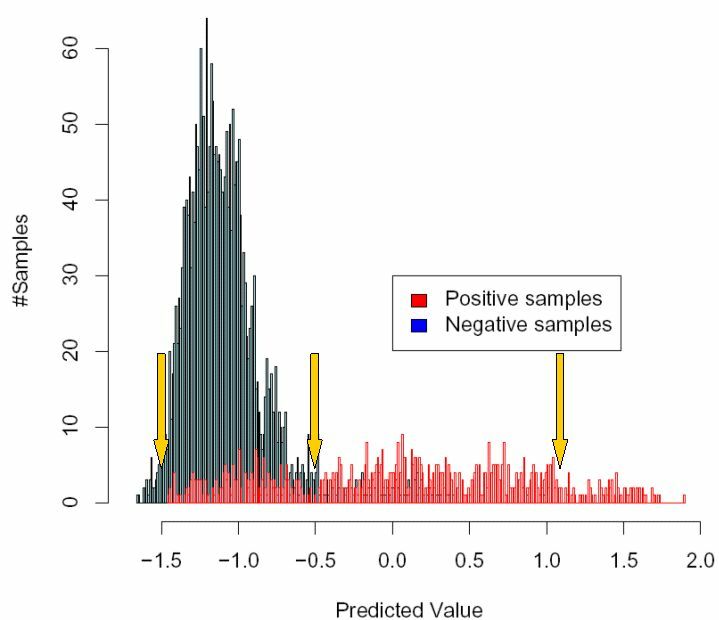 The trade-off between detecting many positive samples and predicting few negative samples as positive is immediate from the values shown in the select boxes. For example, the preselected value that is shown for detection of CXCR4 usage means that 10% of all samples that are X4-incapable will be predicted as X4-capable by our classifier. If you want to be more sure that a virus is really a X4-capable virus, you can make another selection in the box and choose a false positive rate of 5%, for example. However, this comes with the drawback that more X4-capable viruses, capable of using CXCR4, will be missed and falsely predicted as X4-incapable. As we have seen above, "behind the scenes" this is simply lowering the cutoff. General information. Three kinds of information are shown here: the sequence identifier (which you could type into the first field of the input page), the FASTA header of the sequence you pasted in or uploaded (if your input was just the raw sequence, nothing is shown here), and finally, the date at which the prediction was made. Additional clinical parameters. Here, the additional markers given on the input page are shown again. Aligned V3 region. Here, an alignment of your query sequence to the consensus sequence is shown. Predicted phenotype. Here, the prediction whether CXCR4 can be used as a coreceptor or not, is shown. Depending on the given clinical parameters, one or two predictions are shown. Both are conposed in the same way. geno2pheno[coreceptor] is based on a statistical learning method called a support vector machine (SVM). We used the libsvm tool provided by Chih-Jen Lin. Since SVMs are a two-class classification method while the coreceptor problem has three classes (R5,X4,R5X4) and since it is only important if the virus can use CXCR4 or not, we have only trained models for the detection of X4-capability, in which X4 and R5X4 viruses are taken as the positive class. The choice of SVMs is justified by a comprehensive evaluation of different approaches to HIV coreceptor prediction. In this evaluation, SVMs outperformed all other methods (including the classical charge rule, decision trees, neural networks, position-specific scoring matrices, and mixtures of localized rules). The figure below summarizes the results of our experiments in detecting CXCR4 usage. In this so-called ROC (receiver operating characteristic) plot for each method, for all possible cutoffs (recall the discussion above), the false positive rate is plotted on the x-axis, and the true positive rate on the y-axis. It can be clearly seen that the SVM (we experimented with different input representations and kernel types) outperforms the other methods, especially in regions with a low false positive rate, which are the regions of practical interest. The evaluation is based on publically available data (mainly from the HIV sequence database in Los Alamos, but we also took some sequences from publications that have not been included in the Los Alamos database so far). All in all, we had 1100 V3 sequences (769 R5, 210 X4, 131 R5X4) from 332 patients. In each training-test-run during the cross-validation procedure, only at most positive and one negative sequence were incorporated for each patient, thereby avoiding epidemiological bias as much as possible. More detail can be found in the relevant publications.